White reflector generally reflects less than half the light to the subject. Color saturation is generally lower than silver or gold reflector, and when we use white reflector outdoor, the photo will have slightly warm color cast (orangish). 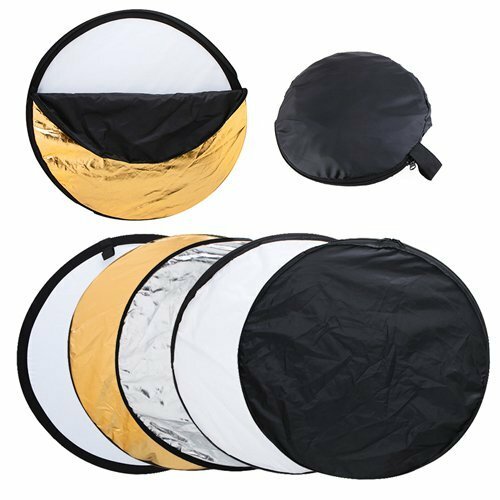 White reflector is a versatile reflector and usually use in wide range of photography as a fill light. It is used to reduce highlight-shadow contrast. Silver reflector is similar to mirror. It reflects pretty strong light to the subject. Color saturation tend to be high, and when we use silver reflector on location, the photo will have slightly blueish color cast because it mirrored the blue sky. In studio, the color cast is neutral (the same with source of light). Silver reflector is usually use for studio portrait or product photography. Black reflector - Because black color absorbs the light rather than reflect the light, the black reflector is usually used as a GOBO or to block the light from spilling to unwanted area. Difusser Panel - This panel will forward and soften the light that hit the subject. Diffuser panel is usually use for portrait or product photography. Portable -- Folded Size Only 10in,With a Portable Case,Suitable for Travel or Storage.